Discussion in 'The Garage' started by cmarts, Apr 7, 2018. Hi I am a new bike owner and I recently purchased a 1975 yamaha xs650 (TX650B?). Heres what I know about the bike. It was originally purchased from a farm in Southern Saskatchewan where it had been stored in a barn for a long time. The previous owner lost interest in the bike and let it sit for a while, letting the gas rust the tank more than it already was. When i acquired the bike it was still running and idling but the owner claimed it would stall after getting up in first gear and all that was needed was a carb sync. The previous owner also rebuilt the forks and carbs as well as replaced many parts as listed. It has a little over 7000km in original mileage. So far I have rebuilt the petcocks, lined the fuel tank with por 15, throughly cleaned the carbs, fixed the bendix gear, replaced the oil, and adjusted/lubricated clutch and throttle cables. Stripped the tank of paint. My future plans are to powder coat the motor and rims. Replace the bendix gear (clip had already been tightened once and has lost its strength. Gear is chewed up). Paint the tank. Fix the clutch cover where I stripped 2 bolts into the block. Sync and tune the carbs. Take it out for a test drive when it warms up (-22C on April 6th). My main issues right now are with the carbs leaking gas from the bottom of the bowl (as shown in picture). Not sure what the issue could be. Carbs are BS38 CV solex non linked with rebuild kit from Mike XS. I would appreciate any helpful tips going forward with my project. Ok - welcome to the group! Just a small thing - the correct designation is XS650B for the 1975 model. The TX designation was used on (Ithink) the 1974 model. May need to properly identify the carbs. Early carbs had Solex on the cap and was removed from the top covers in 72. 74/75 Carbs wouldn't have had the solex on the carb cap, These caps can be interchanged though so it is not a given. robinc, Mailman and MaxPete like this. So these have a choke on one side only thats not linked, the venturi floor is not raised, but there is solex on the carb cap. They are 74/75 BS38 with early BS38 solex top caps? Thanks for the insight. No wonder i couldn't figure out what year they were. As far as the leak is going, im 99% sure the float is just getting stuck (see last photo). When the float needle is fully extended is rests on the floats at an angle, jamming it in place and stopping the floats from raising. How do i stop this. Is it because they are the wrong type for the carb because they are brand new. That does look steep. Has the float height been set? - - - As far as the leak is going, im 99% sure the float is just getting stuck (see last photo). When the float needle is fully extended is rests on the floats at an angle, jamming it in place and stopping the floats from raising. How do i stop this. Is it because they are the wrong type for the carb because they are brand new. just a thought on those dangling floats, can they fall that far with the carb bowls in place or will they bottom out before they reach that angle? I don't think they can. I tried to replicate the floats sticking open with the bowls back on. All good now with the leak. The float was stuck open. Fired up the bike. All good. Set mixture screw -1 full turn. Began to set idle on left side by pulling spark plug wire on right side. Set idle on left side. Started bike again and now I cannot get it to fire on the right side unless I give it gas up to 2500-3000 rpm. Just blows gas out the exhaust. Right side has good spark. Good fuel to carb. Got the bike running good....not perfect. Heres a drive by video. 1. Front sprocket oil leak. Tightened sprocket nut, didnt help. Replacing seal. 2. 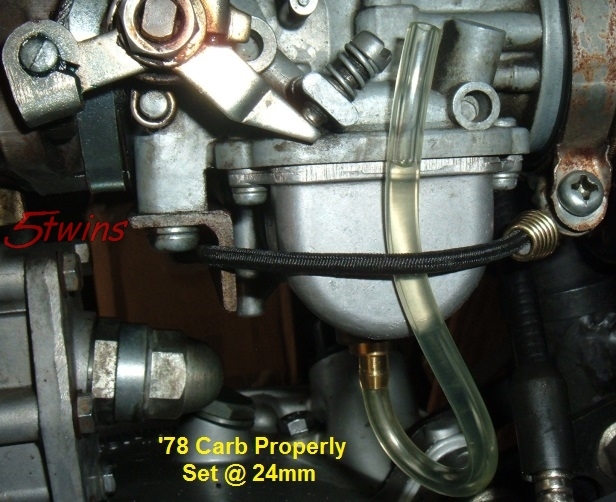 Right side carb idles best with air/fuel idle screw fully seated. I think that means theres too much air getting in. Butterfly shaft seal on order. Will also check butterfly valve if it seals correctly. 3. Right side exhaust header clamp does not tighten down fully to engine. 1/2" gap. Exhaust leaking through header. Popping on decel. Gaskets on order. 5. Rebuilding gauge cluster with custom piece of laser cut aluminum, using original speedo/tach/ignition. Have design file if anyone would like. Bike is running and driving. Timing good, valves good, compression ok (110 left, 105 right, valves are very carboned up). I can’t for the life of me figure out the right cylinder carb. 130 mains 42.5 pilot, pod filters, straight piped, 74/75 bs38’s. Idle screw at 1/4 turn from seat. Popping on deceleration. I have been able to get rid of the popping by turning the idle mixture screw out (enriching) 1/8 turn, but after riding a while the popping returns worse than before. Turning the idle screw out anymore and the bike runs like crap at idle. I’m not sure what else I can look at, I have read the carb guide and checked everything. Floats are set correctly, tested for air leaks. Left cylinder runs like a dream. May be the pilot/slow speed circuit needs cleaned? Not just the jet but the passages?